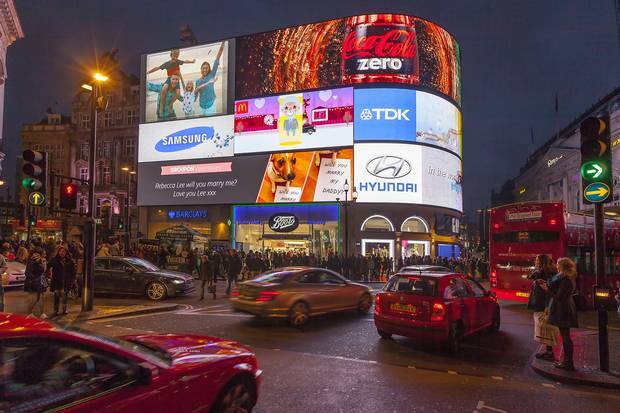 This is the moment an IT worker surprised his partner on Valentine’s Day by popping the question on the iconic advertising screens at Piccadilly Circus. Lee Radbourne, 27, got down on one knee in front of shocked bystanders as the romantic message, featuring the couple’s dog, flashed up on the screen. Family and friends gathered around the couple to hear accountant Rebecca Lee, 27, reply “yes” as tourists took photographs of the pair. 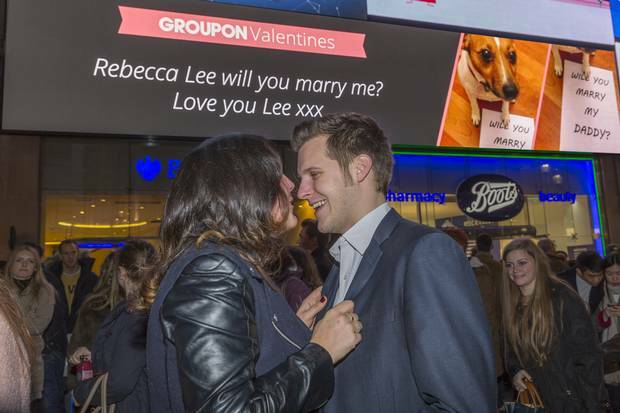 Mr Radbourne had been planning the perfect proposal months in advance after he spotted a Groupon deal to buy a minute of advertising space. He pretended he was whisking Ms Lee to a Valentine’s Day themed ball but instead was concealing a ring in his pocket. The couple were childhood sweethearts but lost touch after college and re-united following a chance encounter on the London Underground. Mr Radbourne, who lives in Hammersmith with Ms Lee, said: “I was thinking about proposing for a while. I saw the Groupon Deal. I always wanted to do something unique and special and it just ticked all of the boxes. She was so happy at the surprise, so shocked, she never thought I would have done it.